I. Love. Owl. Storytime. Between the plethora of resources, the adorable owl crafts and the way that even my youngest kiddos enthusiastically say, "Hooooooot," it's easily one of my favorites. The owl books are so popular that when I shot the photo for this post, a number of the books that had been included in the Owl Storytime had already been checked out by excited little readers. Today's felt board rhyme came from Leah and Mollie over at Sunflower Storytime, their "What a HOOT" storytime post is adorable. One flew away! How many do you see? She flew away! How many do you see? This was a big hit! 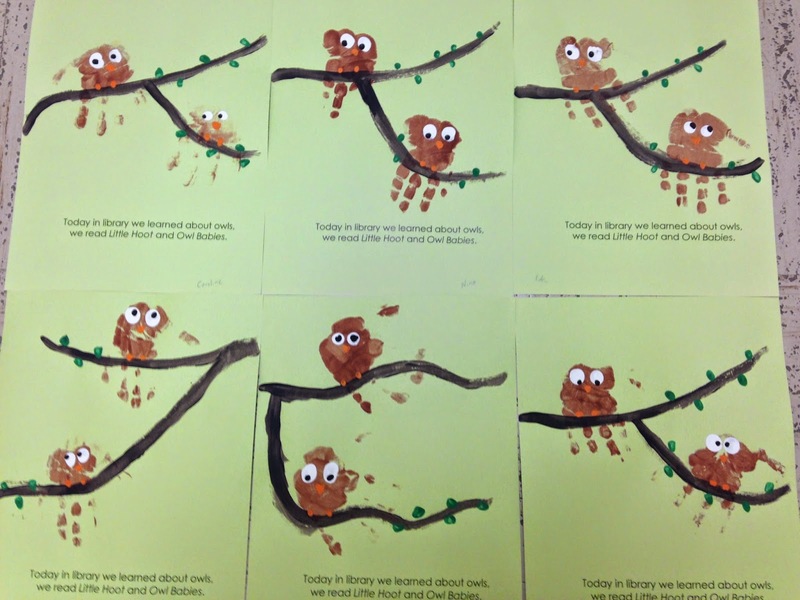 Before the kiddos left, they made these adorable (and very easy) owl handprints. Once the handprints dried, my lovely library assistant and I added the darling details. I am in love with these! I was also thrilled to discover that I could feed construction paper through the printer and would be able to add the titles of the books for our parents to reference.